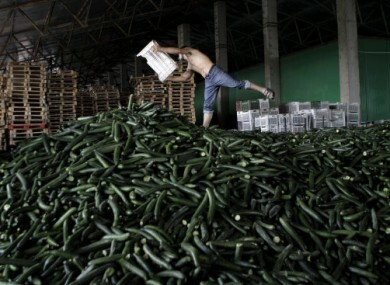 A man balances on a pile of cucumbers set aside for destruction at a warehouse in Bucharest, Romania. THE EU COMMISSION has proposed the provision of a €150 million fund to farmers who have been adversely affected by the E.coli outbreak in Germany. The EU Agriculture Commissioner Dacian Ciolos told reporters that he would make the proposal at today’s emergency meeting of EU agriculture and farm ministers, according to the AFP. The European Parliament is also focusing on the outbreak of the disease. Earlier today, several MEPs criticised Germany for a lack of communication and coordination over the crisis, while others said it was essential to discover the specific source of the outbreak. Meanwhile, an expert at the World Health Organisation has warned that time is running out for finding the source of the outbreak. German officials are still working to determine the source of the contamination, having ruled out Spanish-origin cucumbers and bean sprouts produced on a German farm. WHO infectious diseases expert Dr Guenael Rodier says that the contaminated produce is likely to leave the market in the coming week, meaning the link between patients and the original contamination will disappear. Twenty-two people have died as a result of the outbreak in Germany and one other person died from it in Sweden. Email “EU Commission proposes €150m fund for farmers affected by E.coli outbreak”. Feedback on “EU Commission proposes €150m fund for farmers affected by E.coli outbreak”.